Learn the Anterior release of scoliosis (access by thoracotomy) surgical technique with step by step instructions on OrthOracle. Our e-learning platform contains high resolution images and a certified CME of the Anterior release of scoliosis (access by thoracotomy) surgical procedure. An anterior approach to the thoracic spine can be used for a number of conditions including deformity, tumour, trauma, infection, and disc pathology. In this feature the technique is used to achieve an anterior release as the first stage of treating severe adolescent idiopathic scoliosis measuring over 100 degrees. 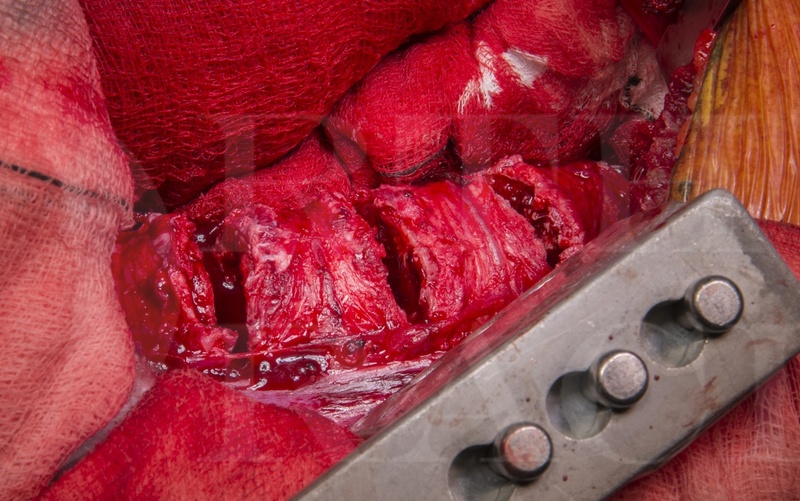 I discuss the indications and considerations around the operation and demonstrate the approach via thoracotomy. The technique allows the discs and rib heads to be removed around the apex of the curve which increases the flexibility of the spine which can increase the curve flexibility and also increase thoracic kyphosis at the time of definitive posterior fusion. These issues are important to allow satisfactory post-operative spinal alignment in both the sagittal and coronal planes. Following this anterior release, the patient underwent a second stage posterior spinal fusion (scoliosis correction). I consider using this technique in adolescent idiopathic scoliosis for patients with a large rigid scoliosis where the pre-operative curve Cobb angle is more than 100 degrees and does not reduce by more than 50% on a traction film. In scoliosis, the thoracic spine often develops a hypokyphosis which can worsen when coronal correction is performed; anterior release is a kyphosing operation and allows improved restoration of normal thoracic kyphosis. Since there are risks associated with this procedure, the potential benefits need to be weighed against the risks involved. Author: Mr Steve Morris FRCS(Tr & Orth).